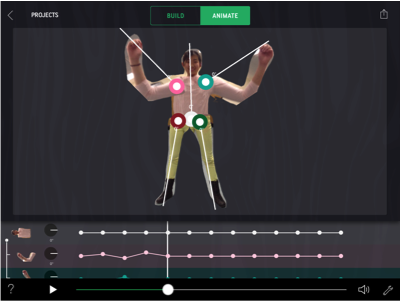 Inspired by dance, Choreo Graph invites you to explore graphs and coordinate geometry to choreograph a character’s dance moves or create an interesting scene with moving parts. 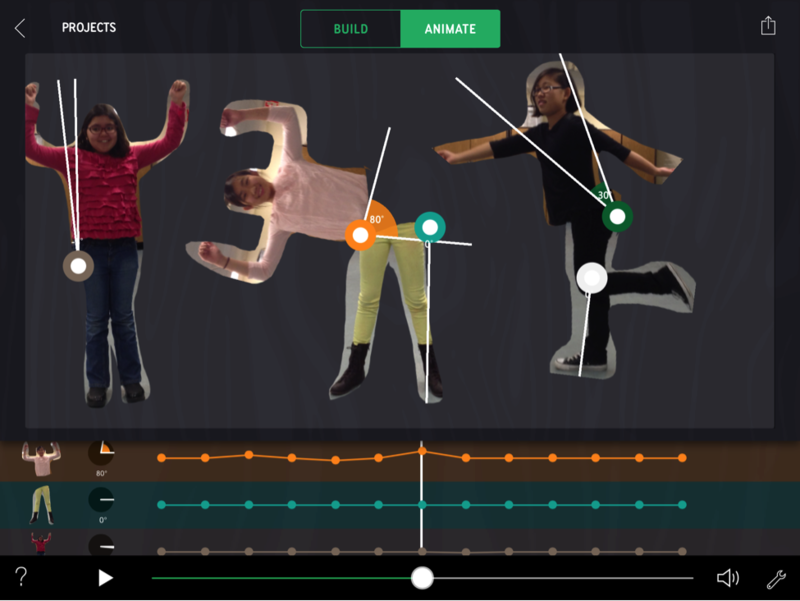 Choreo Graph uses your own photos as the raw material for your animations while noticing rotation and translation. Take a digital photo, cut out multiple parts, connect them, and then animate them. Like other movie editing software, Choreo Graph uses keyframes. At each point in the keyframe, you can manipulate line graphs (Graph Controller) to set the angle of each individual cut out. You can also move pieces on screen, building up a graph of translation through time. When the animation is played, the parts rotate and translate smoothly from one keyframe to the next. You control the complex motions of your animation through the manipulation of the graphs. The screen – or stage – in Choreo Graph where you build and animate includes layers of mathematical visualizations that can be toggled on or off. By showing or hiding a coordinate grid, dynamic coordinates, and angle measurements, you can call up precisely the data you need to choreograph your moves. These visualizations also provide a broad spectrum of curriculum touch points for educator. The primary concepts that you will explore are rotation and translation. Along the way, you’ll develop fluency in reading and using graphs. In some lesson activities, you can create a dance with pics of themselves or their friends, teachers, family, pets, etc. Each body part will be programmed to rotate throughout the animation and you explore direct connection between the angle measurements they program and the resulting animation. Sometimes the results are not what you expect at first. Since you can attach rotating parts to other rotating parts, the motion can become rather complex very quickly. But if you want their animation to work out – practice, play, and figure until the graphs achieve the effects you envision, to get that crazy dance move just perfect. It’s simple to slide parts around onscreen, but these simple actions open up ways to investigate mathematical concepts such as linear equations, slope, coordinate translations, systems of equations, distance formula, etc. Turning on the dynamic coordinates and the grid can turn the coordinates into powerful tools to define the translations in your animation. Some Choreo Graph activities invite you to use such nomenclature as: [(x-h), (y-k)] where h is the horizontal distance traveled on the coordinate plane, and k is vertical. Those are precise directions of motion from A to B. In using Choreo Graph, you can discover how to interpret graphical representations of these rotations and how translations guide animated figures. Exploring the graphs of the rotations addresses a common misconception of graphs—that the graph of an event is the same as a picture of the event. For instance, by creating symmetric motions, you invariably confront this misconception. To have both arms go up symmetrically, one of the arms will be rotating counterclockwise, and the other will be rotating clockwise. The clockwise rotation is a decreasing angle, so as the arm goes up, the graph goes down. To make arms on either side of a animated character go up, you have to build graphs that go in different directions. Choreograph activities are good opportunities for students to refine their understandings of how graphs can relate to real-world situations, and to develop fluency in interpreting graphs. These activities can also provide rich opportunities to discuss misconceptions and start to dispel them. Choreo Graph invites you to to use your imaginations and create impossible motions such as a dancer with every body part flying apart and twirling around onscreen. However, there is also great potential to create direct representations of motion in our real, shared world. Dances that approximate actual dancing, boats on the sea navigating a map, vehicles driving through a city, objects flying through the air, molecules floating into place in a solution, planes flying over buildings. You can approximate all these motions in Choreo Graph, using translations, rotations, and graphs. As you engage with Choreo Graph, you might notice things like, “Wait, that angle is too much,” or, “that’s not steep enough,” or, “those two birds should intersect here not there.” The mathematical visualizations encourage you to start to insert mathematical thinking into your animations because you care about achieving effects that match your vision. This kind of analytical language becomes part of the creative process. Here is a brief tutorial to get you started in Choreo Graph.